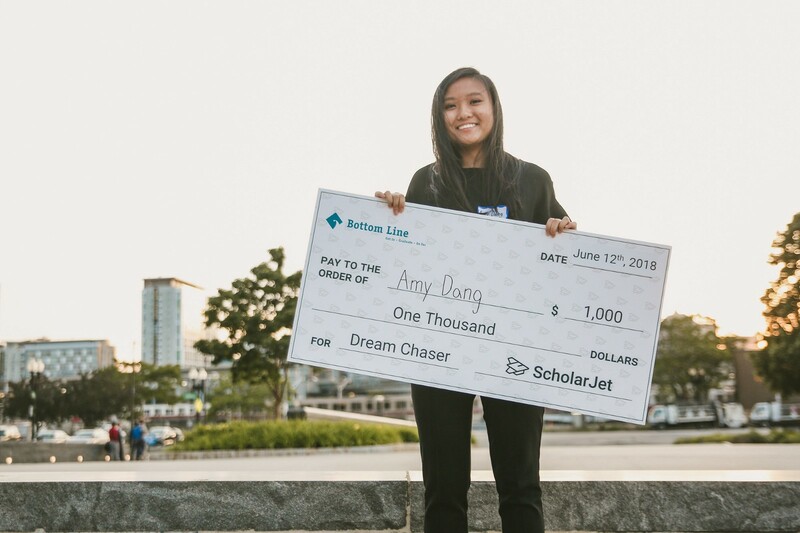 I had the pleasure of interviewing Amy Dang, the winner of the Dream Chaser Competition. The competition was to share your dreams and aspirations for the future. For Amy’s $1,000 winning scholarship submission, she created a video about how different objects can have different meanings in her life and how they have shaped her future. This competition was created by Bottom Line, a national non-profit organization helping students from underserved communities gain access to and graduate college to go on and have successful careers. Amy: my name is Amy Dang and I am a rising sophomore at Northeastern University. I was born in Vietnam before immigrating with my parents to the United States when I was three years old, and we now live in Atlanta, Georgia. At Northeastern, I’m currently pursuing a major in behavioral neuroscience and a minor in graphic and information design. I might change my minor or combine another field of study to my major, but I really love both neuroscience and design, so we’ll see where that takes me! Tuan: What feeling(s) did you have when you found out you were the winner of the Dream Chaser Competition? Amy: I’ll be completely honest — I was genuinely surprised when I found out that I won. About two weeks before the deadline, one of my friends had mentioned the challenge to me and encouraged me to send in a submission, and I remember feeling hesitant to talk about what I aspire to do and who I aspire to be. I considered it for a while before beginning to write the monologue and put together the video, and since I worked so close to the deadline, I was surprised when I found out because I didn’t think I had much of a chance at winning. One other thing I remember feeling was gratitude, not only because the judges liked my submission but also because I had such a good support system around me while I was working on it. If it weren’t for my friend who encouraged me to take on the Dream Chaser Challenge, I wouldn’t have considered sending in a submission in the first place. I also mentioned working on the scholarship when I called home, and my parents showed excitement for me as well. My sister also filmed some shots from home to send over and one of my friends filmed the opening shot, so it definitely wasn’t a one-man job. Everyone who supported me contributed to making the submission come together, so gratitude was really a dominant feeling when I found out my video was chosen. Amy: There’s a Youtuber named Will Darbyshire whose videos I watch sometimes, and two things I love about his videos is how genuine he comes off as when he shares his perspectives and insights about the topics he talks about and also how his simplistic yet intentional approach to storytelling through words, music, and film is so effective. Although I’m still fairly inexperienced when it comes to filming and editing videos, I drew inspiration from his method of storytelling to tell mine, and I guess it turned out alright! Amy: Keeping it honest was something I always kept in mind when putting together my submission, so I think highlighting all the dreams that I’ve had through my life, from the silly things I aspired to be when I was younger (a part-time author, a part-time artist, AND a part-time gymnast — imagine that) to the dreams that I didn’t reach (such as getting rejected from some of my top colleges), was what made my submission stand out. Also, I think taking the unconventional route of using objects to tell the story instead of only talking about them helped make my submission a little more distinctive. While working on the video, even though for the majority of the process I felt stressed because I worked so close to the deadline, was worried that I might not put everything together in time, and was unsure as to whether my idea was creative enough, I enjoyed it regardless because I was able to talk about something personal that I was passionate about for a scholarship but in a completely different and fun way instead of forcing out a 1,000 word essay. Tuan: What did you learn throughout the submission process — about yourself, your inspiration and the community? Amy: I gained a lot of time to reflect and one of the most important things that I learned — at least in regards to my personal perspective on dreams — is that it’s okay to change your aspirations every once in a while or chase new ones and drop old ones. Life doesn’t work in your favor sometimes and different circumstances throughout your lifetime may cause you to pursue different dreams. I’m personally still learning to accept this idea, but change isn’t something that should be feared. It’s more so something to work with and embrace. On that note, after making the video, I definitely have a more solid idea of the goals I’m striving to reach in the future and what direction I want to go in the next couple of years. Tuan: What did you learn about Bottom Line and the meaning behind the scholarship? Amy: I learned that Bottom Line makes the process of applying to college as well as getting through college easier for first-generation, low-income students, and in a time when higher education is becoming more and more accessible, it’s essential that students who may not otherwise have the opportunities or resources to receive the guidance they need in pursuit of a degree are provided with this guidance. Bottom Line does exactly that and matches mentors to students, expanding their chances of success within and beyond the scope of whatever dreams each student sets out to pursue both throughout and after college. Having said that, the scholarship that the organization created aligns with their ideals and emphasizes the belief that no matter what circumstance an individual is born into, he or she should have the opportunity to chase their dreams and follow their aspirations. That’s an idea that I certainly stand behind, and I also learned that the organization is currently serving 7,000 students, which I think is incredible! Amy: Skills-based competitions really level the playing field for students applying for scholarships since not all students excel at writing essays like those required in traditional scholarships. Not to mention, they give students a unique platform to express themselves and their ideas in a fun and creative way, past the restriction of the written word and instead with a multitude of other mediums through which students can convey their different talents and passions. Amy: Right now, I would say that even though I don’t have a solid plan yet, I do know that I want to combine neuroscience, technology, and design into one career and work to the best of my ability to contribute in the advancement of these fields. Hopefully, one day I can be a source of inspiration for young girls aspiring to go into these fields as a part of the growing yet still unfortunately underrepresented community of women of color in STEM. Tuan: What are two pieces of advice you have for future students who are looking to participate in an skills-based competition? I would suggest to find a challenge that you would really enjoy doing or one that you’re particularly excited about and to have fun! Even if you don’t end up winning, at the very least you get to showcase what you love to do or what you’re passionate about, and I know it’s a very cliché thing to say, but that in itself can be rewarding. Amy: Ellen Degeneres, easy. She’s had years of experience in the entertainment industry, so you can bet she’ll keep me laughing for an hour at the lunch table — and with me, it really doesn’t take a lot. In all honesty though, Ellen has always been a great source of inspiration for me. No, her net worth isn’t in the billions and no, she’s not ridiculously talented or an incredible genius or anything, but she does have a way of bringing people together with her humor and her good heart. She doesn’t hesitate to acknowledge the good that people have done in their respective communities and doesn’t think twice about giving back to those who deserve it or need it. Most importantly, she’s followed her passions and has largely succeeded in doing so, and I’d really like to gain insight on how she has managed to do it all and still have so much joy to spread around. Besides, she’s probably the best dancer on daytime TV and who doesn’t love dancing? Amy: Thank you again! I’m grateful to have found out about ScholarJet and all of the incredible things you’re doing for students! You can learn more about Amy by connecting with her on LinkedIn.